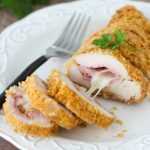 A delicious keto chicken cordon bleu with a crisp coconut coating. It's an easy entree that's elegant enough to serve on holidays! Combine sage, basil and marjoram. Wash chicken with cold running water. Pat dry. Make an incision at the side of chicken and slice without cutting in half. Open chicken fillet and season with salt, black pepper and mixed herbs. Lay 1 slice of ham, 1 tablespoon of grated cheese and top with frozen mozzarella cheese. Fold and seal edges with toothpick. *Not too much salt if the cheese is salty. In a bowl with beaten egg, add 1/8 teaspoon of mixed herbs. Dip both sides of stuffed chicken fillet. On a plate, spread dried shredded coconut and sprinkle the remaining mixed herbs then season with salt and black pepper. Coat stuffed chicken fillet. In a slightly greased baking pan lined with foil or parchment paper, lay chicken fillets then loosely cover with foil or paper. Bake in a preheated oven at 400°F for 20 minutes. Uncover foil, place in the broiler for 5 to 10 minutes or until coating is golden in color. Transfer to a platter, serve with Cheese Sauce on the side. Enjoy!